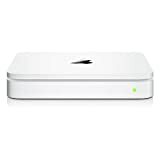 Working in conjunction with Apple’s newly developed Time Capsule software, the Apple Time Capsule (sim dualband) NAS is an almost perfect way to easily integrated the software backups with a hardware product. Not exclusive to Mac users, Windows users can also take advantage of the automatic wireless backups that the 1TB Time Capsule offers. 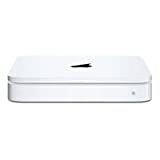 Probably the most unique feature about the Apple Time Capsule DualBand is that it acts both as a network attached storage device and a wireless router. But while they could have stopped at just integrating a wireless router within the device, they stepped beyond that and made a dualband wireless router. Dualband wireless routers are capable of providing both Wireless G and Wireless N speeds across the network so that different devices, depending on the technology integrated within them, can utilize the fastest speeds available to them. Most routers are only capable of delivering G or N at the same time, meaning some devices get left out of the wireless range because the router can’t broadcast both signals. If nothing else, the dual band capability of this NAS and router could be a big enough selling point. The Apple Time Capsule backs up your data wirelessly so you can set it and forget it. A lot of NAS devices popping up these days are adopting the same approach of being able to set the NAS device to automatically back up important data and files from computers connected to the network. While it isn’t revolutionary, it’s nice being able to sync wirelessly or through one of the gigabit Ethernet connections the device has. You obviously won’t be able to achieve gigabit speeds all the time, but transfer speeds are quick and nothing to complain about. While we never got to see our Apple Time Capsule collapse and burn in the cataclysmic fashion that other users like to exaggerate, we have heard a few bad things about how these products perform in the real world. With complaints from the easily rectifiable, “it gets too hot,” to “the hard drive stopped working,” we wonder what’s going on with the quality control on these things. With a feature rich device such as this, a bit better quality control could guarantee an even bigger market share for these NAS devices. For techies, replacing a hard drive after a year or two should be no big deal, but as a product coming from Apple, a company often held in high regard for the reliability and long life of their products, it’s very disappointing to hear that the Apple Time Capsule hard drives aren’t the best out of the box. Luckily, you get a 1 year warranty in the box to hopefully fix any problems that you do run into. Overall, we’d say that the Apple Time Capsule is still a good buy despite the hard drive problems we’ve heard. If you’re worried about the device keeling over and dying within the first few months of use, you can pick up an aftermarket hard drive that you know will last, or utilize the Apple warranty and get a new drive straight from Apple. 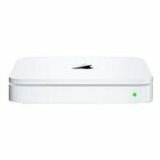 The Apple Time Capsule (Sim DualBand) NAS product line is available for purchase with storage sizes of 1TB and 2TB.